The first step in growing orchids from seed requires careful planning. The choice of parent plants will determine the success of the cross, so the parent plants should have desirable characteristics such as vigorous plant and root growth, disease resistance, good flower shape, size and colour, good flower count, strong stems to support the flowers, compact plant habit and good tolerance to heat and cold. Selfings produce seedlings that resemble the parent plant more closely than do sibling crosses but they tend to produce weaker plants. POLLINATION is the process of transferring pollen from one flower to another. Orchids do not have powdery pollen like most other flowering plants. Their pollen grains are compressed into structures called pollen masses, which are about the size of a grain of wheat. Instead of transferring pollen from one flower to another with a brush, as with other plants, orchid pollen is removed by means of a toothpick because of its compact structure. The orchid’s pollen masses are located behind the pollen cap at the end of the column. To gain access to the pollen masses this cap must be hinged to one side or removed completely. The pollen masses may then be transferred to the stigmatic area, a sticky depression located below the pollinia. Pollination tends to be more successful when the flowers are fragrant and fresh. Make sure that you record all information about the pollination in a notebook and also tag the pollinated flower(s). 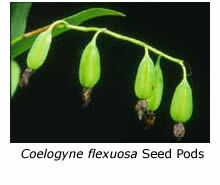 It is a good idea to make a reverse cross as well, because one plant may be a better capsule parent than the other. If you want to make a cross between two orchids that flower at different times of the year, you may store pollen from one flower for later use with a flower from another plant. The pollen will last for several months in a refrigerator at about 4°C if kept dry by storing it with a moisture-absorbing reagent, such as silica gel. When you are ready to use the stored pollen, it must first be re-hydrated. Place the dry pollen masses on a glass plate so that they just touch a drop of water and leave stand for an hour; the swollen pollen masses will then be ready to use. CAPSULE DEVELOPMENT. Once the pollen masses have come into contact with the stigmatic area of the recipient flower, the pollen grains that comprises the pollen mass will be stimulated by chemicals on the sticky stigmatic area. Each pollen grain will produce a pollen tube and the resultant mass of tubes from the many thousands of pollen grains will grow down through the column until they reach the ovary behind the flower. Fertilisation then takes place and hopefully each ovule in the ovary will produce an orchid seed. A few days after pollination the flower will fade in response to the removal of the pollen masses but this phenomenon does not necessarily indicate successful pollination. Over the following weeks or months, as seed forms, the ovary develops into a seed capsule that gradually matures. Initially the capsule will be dark green and quite hard; it will have thick walls and be largely empty. As the embryos grow inside the capsule, its walls will become thinner, and the seed will develop, causing the capsule to swell until it eventually reaches maturity. During this time the capsule usually changes to a yellowish green colour and its three ribs become more prominent. The plant should be protected from temperature extremes, rain, excess humidity, direct sunlight and insects, because temperature extremes may cause seed capsules to drop, excess humidity may result in fungal damage, insects may eat the seed capsule and its contents, and sunlight may cause premature splitting. COLLECTING SEED. The following table gives a rough indication of when a seed capsule is likely to mature. It’s simply a guide because the time taken for a capsule to mature depends not only on the genus but also on the time of year, climatic zone, ambient temperature and light intensity. The process takes from a few weeks for disas up to 18 months for some paphiopedilums. When the capsule reaches maturity, it cracks and releases dry seed. INTACT CAPSULES OR DRY SEED? There are advantages and disadvantages with either way of collecting orchid seed. Dry seed must be treated with strong disinfectants to kill any fungi or bacteria present, a process which often destroys some seed. Using intact seed capsules eliminates the need to sterilise seed before sowing, which generally results in faster and more complete germination. However, if intact capsules are harvested while the seed is immature, there may be little or no germination. Also, harvesting a capsule too soon may result in only half the seed being mature, as it matures progressively along the length of the capsule. There are also other reasons for choosing either dry seed or intact seed capsules for specific genera. 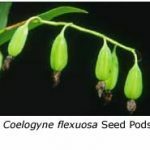 Many odontoglossums are infected with viruses, and scraping their seed capsules to remove their seed almost always transfers these viruses to the seedlings. There is a much lower chance of passing on viruses when using dry seed and thus it is possible to obtain virus-free seedlings from infected plants. Some disa seed begins to germinate while it is still inside the intact capsule. This seed will be destroyed when disinfecting dry seed and therefore only intact capsules are recommended for disas. The dry seed disinfection process actually breaks the tough seed coat of some paphiopedilums, greatly improving germination but this is not always so. WHEN ARE INTACT CAPSULES READY? Probably the best way to determine when to harvest seed capsules is to look for changes in their visual appearance while illuminating them from behind. The best time to harvest seed is just before the capsule splits. The best indications are that the capsule has swollen, its colour has changed and the three ribs that join the capsule segments together have begun to lift. As the seed of many orchid genera nears maturity, its colour changes from white – see some genus-specific notes in the table below. If uncertain whether a capsule is mature, it’s probably best to wait and collect the dry seed, because early harvesting will result in immature seed and poor germination. WHY SOME POLLINATIONS FAIL. Many orchids are self-incompatible. Orchids may have different chromosome numbers and mismatched numbers often lead to non-viable seed or sterile seedlings, e.g. triploids. This incompatibility is especially problematic with complex sarcochilus, odontoglossum and masdevallia hybrids – their seed capsules may turn bright yellow and fall at two-thirds maturity, or simply prove to be empty when they reach full term. STORING SEED CAPSULES AND SEED. Store intact seed capsules or dry seed in paper envelopes, never in plastic bags, as sweating in sealed plastic containers may lead to fungal damage. Seal envelope edges with tape, because orchid seed is so fine that it may otherwise escape. Always pack the envelope in a rigid container before mailing it to the orchid flasking laboratory.